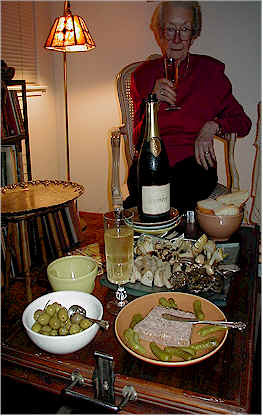 Marjorie Enjoys a Sip of the Schramsberg. "Good bread crumbs from flavorful, sweet baguettes. I use Acme and a little bit of Grace Baking breads. 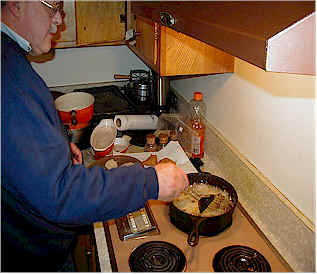 And the bread crumbs need to be slightly coarse, not ground to a fine powder. Fresh seafood is mandatory! I'm using scallops, prawns, calamari and some snapper." 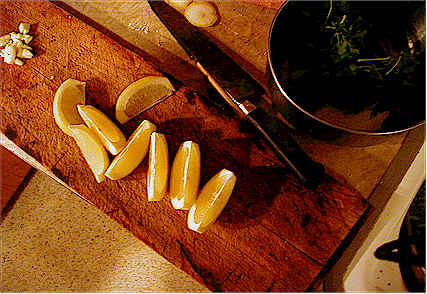 This cutting board seemed like a visually pretty "still life." Bob garnishes the plate with some fried parsley, a nice enhancement. We tried a Colle dei Bardellini 1999 "Pigato," a very light white wine from Liguria. We concluded this, while a perfect wine for such a plate, would probably be at its best in some trattoria in Portofino, served with Bob's Fritto Misto del Mare. Nice, but light and simple. Better was the La Carraia 1999 Orvieto from the "Poggio Calvelli" vineyard site. This is a blend based on Grechetto with Verdello, Drupeggio, Malvasia, Trebbiano and Chardonnay. This wine has hints of golden apples, apricots, vanilla (fermented in French oak and aged for about 2 months in wood)...it could use a slightly higher level of acidity for the Fritto Misto, but we enjoyed it immensely. 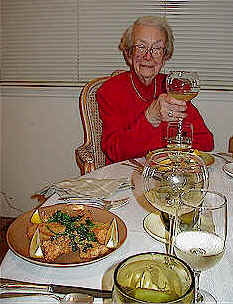 Marjorie toasts to Bob's Home Cookin'! 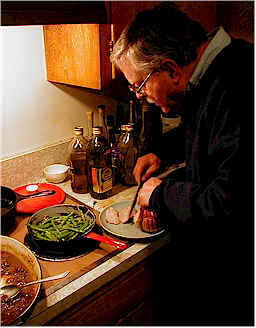 Bob prepares the wild mushroom sauce for his superb veal roast. 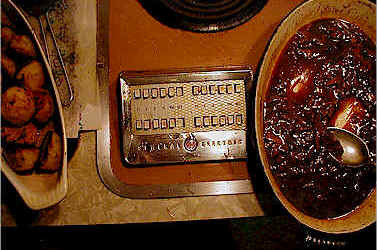 The kitchen was modern in 1960, perhaps. Veal Roast with a wild mushroom sauce. (Bob is an avid mushroom hunter and, so far, nobody has died at his table). 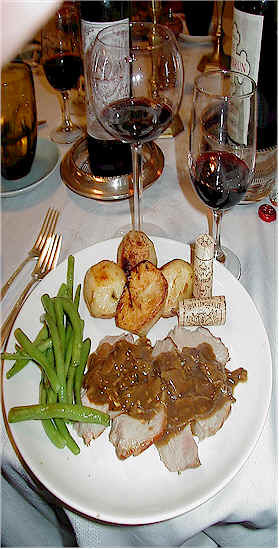 We compared two Bordeaux wines with Bob's Veal Roast with Porcini Mushrooms. Both were from the 1998 vintage. The Pichon Baron showed nicely, hints of cedar box and blackcurrant fruit. I am not certain that I don't prefer the 1997 and 1996 vintages of this wine. Curious to taste this fellow's "top" Bordeaux, I wanted to see what Chateau Chambrun 1998 tastes like. We had this guy's 1998 Chateau Mouton in the shop and like it very much. It's a great wine for $16.99. The Chambrun is a "Lalande de Pomerol" appellation and costs about $55 a bottle. It was rather rich and full, hints of plummy Merlot fruit on the nose and palate. I'm not sure either of tonight's reds is worth the price, but we enjoyed them. PROSCIUTTO AMERICANO, CIOPPINO & STUFFED CABBAGE and More! ALANNA & CLEMENTINE ARE 10! ALEXIA AND HENRY BRING OLD WINE. A fancy San Mateo Restaurant has re-opened. Our friends from Castiglione Vietti in Piemonte stop by for a few days of promoting their wines and a few minutes of fun. 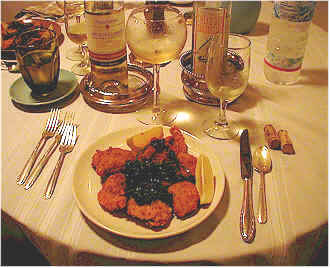 Ulli Bauer is a top home chef in the small German town of Rodgau. Her husband, Josef, is a gracious host and always opens many (and I mean many) interesting bottles. 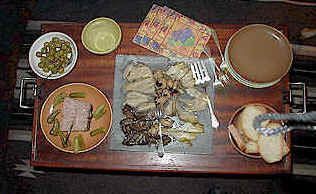 The wives conspired to "kidnap" their husbands and celebrate with some terrific meals and good friends in Europe. This was a non-stop wine & food marathon thanks to Norbert & Gaby Auth.